Preheat the oven to gas 4, 180C, 350F. Peel the squash, scoop out the seeds and cut into cubes. Place on a lined baking tray and drizzle over 4 tablespoons olive oil. Season with salt and pepper, mix with your hands and roast in the oven for about 20 -30 mins until soft. Check after 15 mins and reduce the temperature if it starts to brown. Put the lentils in a saucepan and cover generously with water. Add a clove of garlic and a dash of olive oil. Bring to a boil and simmer for about 20 -30 mins, until just soft. Drain well and set aside to use. While the pumpkin and lentils are cooking, chop the onion into quarters and finely slice. Slice the remaining 2 cloves of garlic. Add 3 tablespoons of olive oil to a saucepan and add the pine nuts. Gently cook until they just start to go golden brown, then add the onion and garlic and cook for a further 15 mins until soft, stirring occasionally. When the onion is cooked add the whole cinnamon and the coriander seeds, which can be crushed in a pestle and mortar or by the end of a rolling pin. Add the vinegar and wine, bring to a gentle simmer and cook gently for about 10-15 mins, until the spices have been infused and the vinegar and wine reduced by half. Set aside and remove the cinnamon stick just before serving. To assemble the salad, place the rocket and lentils in a bowl and drizzle over about 4 tablespoons good quality olive oil. Season the salad with salt and pepper. Mix well and place on a large serving plate. Scatter over the pumpkin and then finally drizzle over the pine nuts and onion mixture. 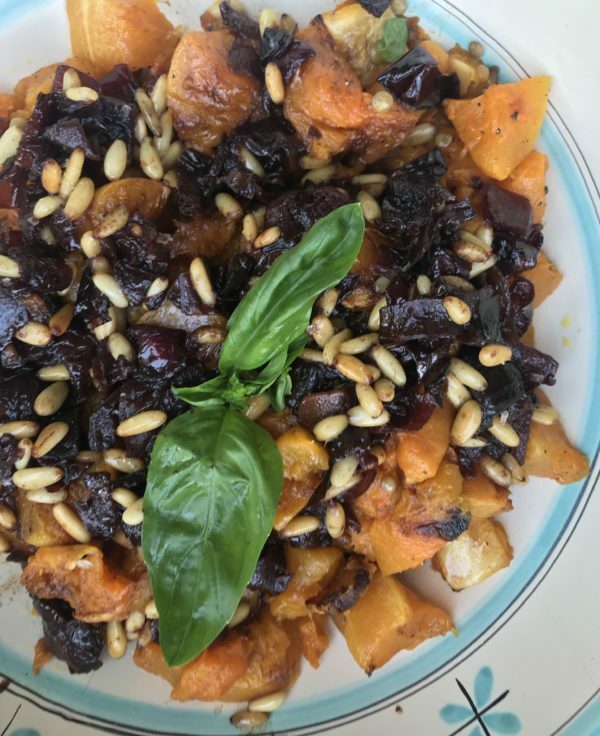 This is a lovely simple salad for the autumn. You can omit the salad and just serve as a vegetable side dish with simple roast meat. Serve with toast smeared with goats cheese or feta, a sprinkling of parsley and a drizzle of olive oil on top to make it a full vegetarian main course. Feta adds a sharp salty flavour. Goats cheese is probably the more subtle of all three. So use which ever you think works best for you.